Felicity Peters lives and works in Perth, Western Australia. As an established and award winning jeweller Felicity Peters has work in public collections in Australia and overseas. Felicity has been selected into many overseas and national exhibitions and her work is featured in a number of international and national publications. Felicity&apos;s practice consists of exhibition pieces, commissions and small production ranges. Corporate and government commissions are an important part of her work. Felicity is internationally recognised for her skills and her development of the beautiful Korean technique of Keum Boo, where pure gold sheet is fused to a sterling silver base. Felicity, who is available for workshops in this technique, was the Australian Adult educator in 2005. 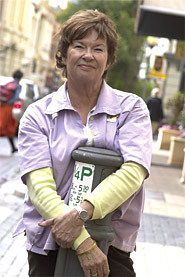 In 2007 Felicity was awarded a three month Australia Council residency in Rome. This led to her interest in the Etruscan art of granulation. Her work is also influenced by architecture, the landscape, travels and her personal and social philosophies.. In 2009 Felicity Peters was awarded a Creative Development Fellowship by the Department of Culture and the Arts through the Government of Western Australia. Up two of these awards are given out each year to established practitioners from all the various art forms. The Fellowship allowed Felicity to travel to San Francisco to study granulation with Kent Raible, research and develop CAD designs, and work towards solo exhibitions in Legnica Poland and the Lesley Craze Gallery in London. Felicity has continued with new ideas developed during 2009, expanding into fashion accessories with The Funk Dimension label as well as using computer aided designs to expand her practice. Felicity's continuing travels to Poland led to a solo show in Poland, and presentation lecture at the Legnica Silver Art event in 2011. Another solo Jestem-I am at Studio 20/17 in 2011, gave Sydney people the chance to see her Polish inspired pieces. The Powerhouse Museum purchased one of her Voluptuous Woman brooches for their permanent collection. Recent work was the deconstruction and reconstruction of a egg whisker by home wares company Normann. This work has so far produced five stunning pieces. Check these out in the Neckpieces section. Felicity says she loves rearranging unique objects into art pieces, and that the stimulation from this exercise always rubs off in her practice as well as keeping her ideas fresh and unique. 2008 Successful grant application to bring Giovanni Corvaja to Perth for workshop with JMGA WA. 1990-1994 President of Jewellers and Metalsmiths Group of Australia-W.A. Inc. Illusion 39 entrants selected from 395 physical entries Gallery of Art Legnica Poland. First Australian to make the final 40-45 in 30 years the exhibition has been held. Illusion is travelling around Europe for one year.